Have you ever wondered what would happen if an old low-tech toy was given the power to control a modern, really very dangerous tool? The folks at Just Add Sharks did, and they came up with a beautiful thing: the Etch-A-Sketch laser cutter. Armed with an Arduino, a laser cutter and some technical skills, they were able to create a perfect union of retro and modern. 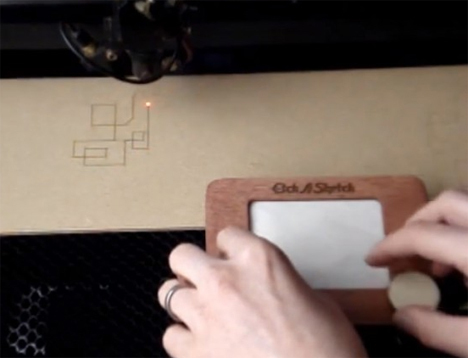 The laser cutter used by JAS has two settings: one that will cut right through wood, and one that will just burn a design on the surface a la Etch-A-Sketch drawings. After re-routing the laser cutter’s original wiring, the new controller had to be constructed. 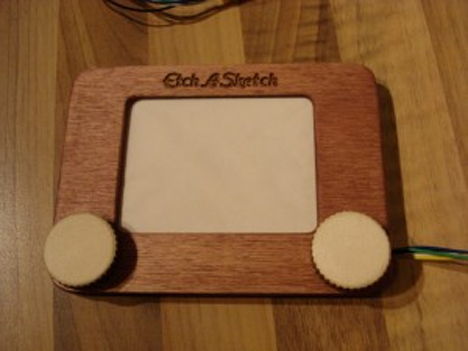 The classic Etch-A-Sketch shape was cut from plywood and stained with mohogany dye. The Etch-A-Sketch logo even appears at the top of the controller. The wooden knobs are actually attached to rotary encoders that control the laser cutter’s path. Sadly, you can’t see the shape you’re drawing on the “screen” of the controller, but you do get the see the laser moving as you twist the knobs, making art just like you did when you were a kid. But this time, if you mess up you can’t just shake the picture clear. If you want to try it yourself, the schematics can be found at Just Add Sharks.